Your skin needs to tell you a lot and we help you to understand it! 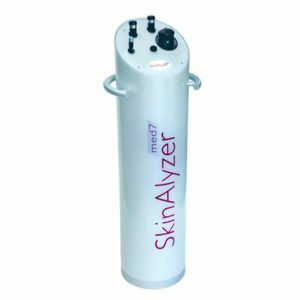 The professional skin and complexion analysis with the Skinanalyzer med 7 enables us to identify exactly your skin´s needs before starting the treatment. Based on objective results, we can develop the correct and individual product and treatment regime for you. This accurate computer-aided skin analysis is realised by sampling probes and a camera for the analysis. Moisture: Measurement of moisture content and the skin barrier. Elasticity / firmness: Determination of the biological age of the skin. Amount of melanin pigment / Tanning ability: Determination of skin phototype and sun factor. Fat: Identification of fat content and visualisation of sebaceous glands activity. Pores: Measurement and analysis of depth of pores and skin´s condition. Pigment spots: Documentation of amount and sizes. Wrinkles: Measurement of amount of wrinkles and sizes.